By the mid ’80s I was 10 years old and I loved to read. Now, I wasn’t reading Tolstoy or Shakespeare, but I was reading nonetheless. Movie novelizations were one thing that really got me interested in reading. I’m not talking about books that “inspired” a movie, or the novel a movie was based on. I’m talking about a novel written AFTER the movie script was written or based on the script of an in-development movie. 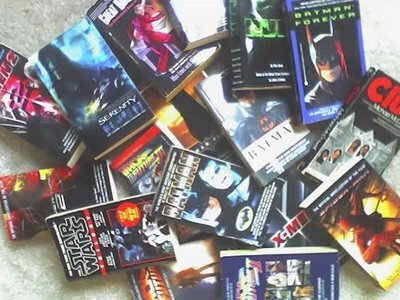 In the ’80s and ’90s, movie novelizations were everywhere, yet today, they are rare if the movie isn’t based on a comic book. Every awesome genre movie got one. Demolition Man, War Games, the Back to the Future trilogy, the Batman movies, even more recent movies like the 1996 Mission Impossible remake had a movie novel based on its script. There was a WaldenBooks in the Riverchase Galleria many years ago (it’s a clothing store now) that had an entire section of movie novelizations. That’s where I spent most of my time at the mall (when I wasn’t in the mall arcade, Diamond Jim’s). Any movie that I enjoyed at the theater, I’d go pick up the movie novelization. For the most part, I still do it. One thing movie novelizations have going for them is that they are, for the most part, only released in paperback. This makes it extremely portable and easy to read anywhere. In these books, the movie story was basically the same, but since the book was usually written on an earlier draft of the script, scenes that were cut out of the movie are still in the book. In some of the better novels, you also get inner monologue of the main characters. It gave an entirely new dimension to the story. Being a pack rat, I still have most of these books. I thought it would be interesting to review some of these novels for you and let you know the good ones and the bad ones and how they compare to the movie they represent. Since I have so many of these books, I’ll only do a few at a time and make this an ongoing series. For a preview of some of the books, see the pic above. I have more, but I need to find them as they are hidden away in cardboard boxes after my move from Birmingham, AL to Jacksonville, FL. The first series of books today will be the books based on one of my favorite series of movies…the Back to the Future trilogy. These were 3 of my favorite movies when I was a kid. When the first was released in 1985, I saw it in the theater at least 10 times. I was a freak for this movie. I almost died when it took 4 years to release the sequel, Back to the Future Part II. Part II was the first novel I bought of this series (at the aforementioned WaldenBooks). I had no idea the first movie had been released in novel form also. Many years later, after all the Back to the Future movies had been released on video, a “garage sale” store opened up about 20 minutes from my house. Now these places are called antique shops, but originally it was a garage sale store. This place was a goldmine for old books as it had an entire room dedicated to selling them. I can’t even tell you how many books I’ve found in this store. It was here that I stumbled across the paperback for the original Back to the Future. It even had the original sales receipt dated 1985. I was dumbstruck. I read it immediately. I began wondering if Part III had a movie novelization. I searched high and low. This was before the proliferation of the internet and Amazon.com or eBay. If it wasn’t at a local bookstore or at a garage sale or second hand store, you weren’t finding it, my friend. After over a year of going back to the garage sale store, it finally appeared, like a great desert oasis, Back to the Future Part III: The Novel. It was my Holy Grail and I had found it. Giddy as a schoolgirl, I bought it and began reading it that night. The books in this series are very true to the movies. You’ll find little tidbits here and there that weren’t in the movie. For instance, the original Back to the Future novel starts with Marty in school instead of in Doc’s lab. Some scenes are longer and some dialogue is slightly different, but overall it’s a really good adaptation of the movies. Years later, before the garage sale store closed, I did find an alternate cover for Back to the Future Part II, it was white instead of blue, but I thought enough is enough. I believe you can find these on Amazon right now from third party sellers, but I’ll always cherish these books because it took me years to complete the set. Coming up I’ll have looks at the novels for Clue: The Movie, The original Batman movies, the Sam Raimi Spider-Man movies and the X-men movies. If I find my old stash of books, maybe I’ll have some more suprises. This entry was posted on April 6, 2006 at 7:36 pm and is filed under Back to the Future, books, movies, pop culture, reviews with tags Back to the Future, book reviews, books, Movie Novelizations, movies. You can follow any responses to this entry through the RSS 2.0 feed. You can leave a response, or trackback from your own site. I remember being 5 (1985) years old and walking through a mall with my Grandmother and Mother. After the mandatory visit to KB Toy Store we wandered into Walden Books. I found the Back to the Future book on the front display case. I immediately picked it up and started flipping through it. Both my mother and grandmother told me that there was no way I could read such an adult book. My answer was “Wanna Bet?” With that they bought me the book and it became the first true novel that I had ever read. Thank you for reminding me of this memory. That is an awesome, awesome story. Thank you for sharing it and enjoying the article. This is a truly amazing article. 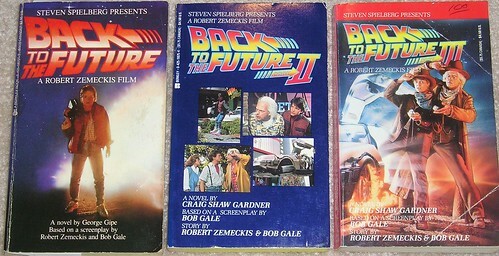 I have always loved the Back To The Future movies and look forward to reading the movie novelization. essentially has the poster art for a cover. favorite era was the ’80s. Thanks for the review! Yeah, I agree the ’80s and early ’90s have all of the best movie novelizations. I still read them, but I’ve been periodically selling some of my collection to a used paperback store to get money for more books. I’ve obviously kept my favs like these Back to the Future novels and Clue. The used store I go to here in Jax, Chamblin Bookmine, has an awesome movie tie-in section. I’ve found Robocop, Butch Cassidy & the Sundance Kid, Predator, War Games and Demolition Man. Lot of others, too.